Brian repaired the vacuum former and planned out a new heating element design. Mike came all the way from Florida to frame the Member Storage door and put in a new lock to prepare for some new security features. 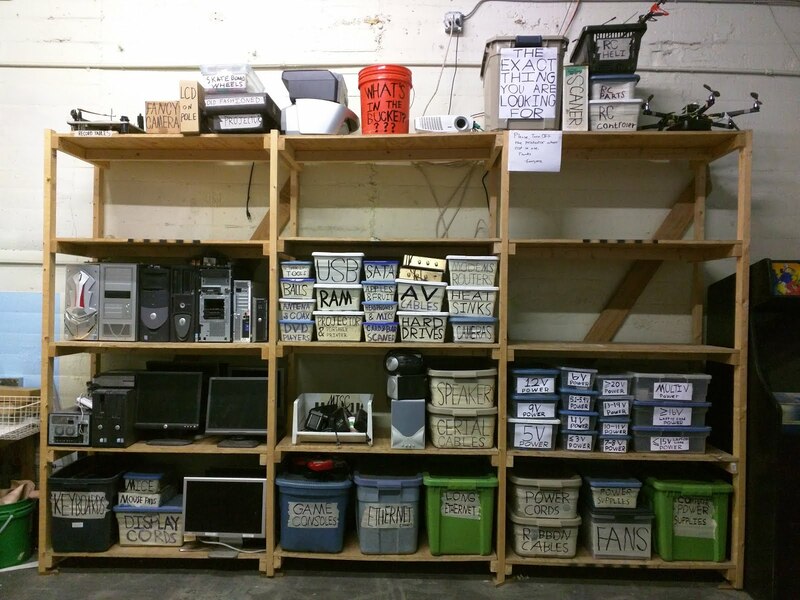 Nathan and crew totally reorganized and cleared out some old obtanium. The new shelves are much cleaner looking. Michelle hacked the LulzBot AO-100 to increase the maximum height, and started printing parts for a new RepRap for the space. Kelly and Scott cleared out the attic of all of the old random stuff to make way for all new random stuff. Rowan, Brandon, and a few others helped to sort glassware for the bio and chemistry room. Paul, Jonathan, and Earl examined strange fruit. We demolished in Member Storage for some more new metal shelves. We put away tools that had found their way from the tool room. We found some time to goof off. Thanks to everyone who came out and helped make Freeside awesome. See you next time!